Over the past seven months, Pinterest has been “experimenting” with promoted pins, but will its news plans to step up its monetisation game have too much of a negative impact on the experience of its users? Four years after its launch and Pinterest is still a firm favourite for content curation, visual inspiration and, of course, virtual day-dreaming amongst its dedicated pool of users. It celebrated its 30 billionth pin last month and according to recent stats from RJMetrics, 84% of the female pinners who signed up to the platform four years ago are still actively pinning to this day. That’s a huge and impressive number given the fact many hot new apps and social networks of the moment usually have a quick and high turnover of users within months, who sign up once excitedly and never return to the platform again – the likes of Jelly and Quora for me. So over the past four years Pinterest has proved it’s not a flash in the pan site for airy-fairy day-dreaming women, but instead a force to be reckoned with and a platform that needs to be cleverly and cautiously exploited by brands. Pinterest’s highly-visual and highly-addictive nature has made it a big hit with a range of brands already. Take a look at the fun campaigns and consistent content curation from the likes of Sephora, Etsy and even General Electric. Both consumer and business-focused brands have proved they can organically engage new audiences, run campaigns and drive traffic with the pinboard platform, so how does paid-for advertising work its way into the mix? Last Autumn, Pinterest began “experimenting” with promoted pins, these are pins from brands that look like regular ones, but come with a “promoted pin” line underneath (check out the photo above). Many users may not have noticed these initial, small scale efforts, but fast-forward to today and the platform has announced it’s set to begin rolling out promoted pins from a group of paying advertisers this time, including Lululemon Athletic, Ziploc and Old Navy. 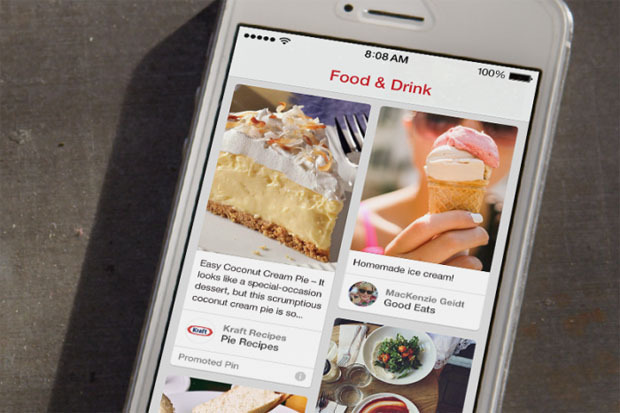 The big question is, will these promoted pins ruin Pinterest’s highly-visual experience? As a team of Pinterest-lovers we’re cautious, but think it could actually be a great move for fans of the platform. After all, how many of you notice promoted tweets? Sure, they often sit there unnoticed if they’re not relevant, but sometimes they do entice us to click, and at the very least they don’t offend us half as much as we thought they would. The thing is Pinterest is a different ball game. Dedicated users have spent a considerable amount of time hand-picking their own content for their boards and curating only the most interesting and useful pinners to follow in their feeds. This would suggest that even a slightly misplaced promoted pin from a brand they’re not keen on could interrupt what is essentially a very personal experience and leave that pinner feeling a bit let-down and pestered by a brand that was looking to make a connection. But let’s not forget who we’re dealing with here, the Pinterest team already understands its audience well enough to know what their main bug bears would be. According to a post on the Pinterest blog, Joanne Bradford, Head of Partnerships at the team, writes that the promoted pins need to be “tasteful, transparent, relevant and improved based on Pinner feedback.” Furthermore, the new paid-for pins will start off by only being in the search and categories feeds, meaning if you prefer to scroll through content solely from those you follow, you won’t be disturbed. In this way, the promoted pins will only be served up to those on a mission to find out more, which suggests this natural form of advertising could actually prove to be helpful, engaging and appealing if the right brands are targeting the right people on the lookout for different types of content – rather than coming to find them when they want to be left alone. Right now it seems like the Pinterest team are switched onto the wants, needs and interests of its dedicated users, so we’re interested to see how they continue to monetise the platform and work with brands while staying true to those that matter – the pinners, the crafters and the dreamers – in the future.